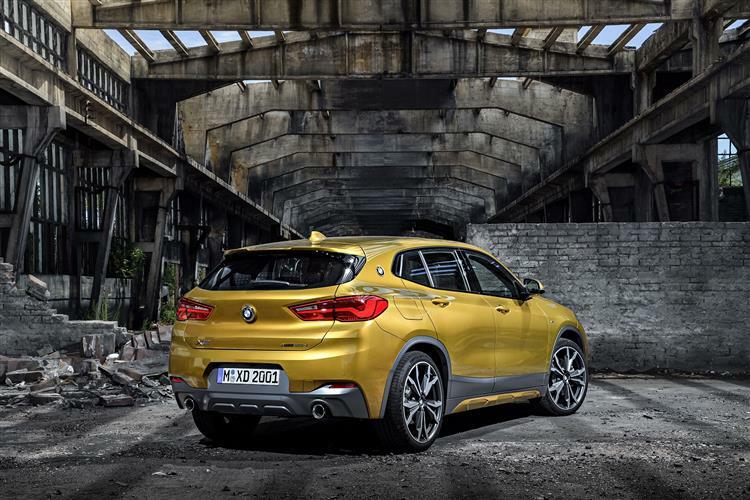 Following a programme already established with its larger SUVs, BMW has produced a sporty version of its X1 model, christened the X2. 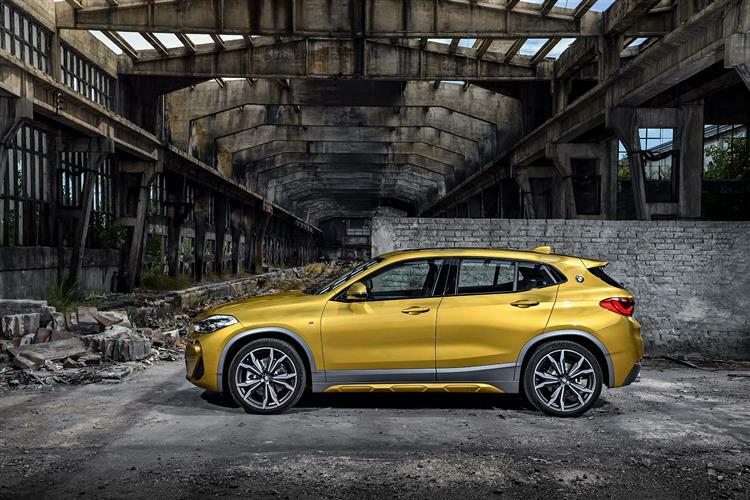 Like the X4 (a coupe version of the X3) and the X6 (a coupe version of the X5), this crossover brings a more dynamic look to the Munich maker's offering in its chosen segment. 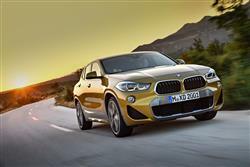 Like its rivals, its dynamically targeted almost exclusively towards on-road use. We're now pretty used to the idea of 'coupe'-style versions of mid-sized and large-segment SUVs. Witness the success of models like the BMW X6 and the Mercedes GLE Coupe in the large segment. 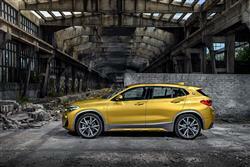 And the BMW X4 and the Mercedes GLC Coupe in the mid-sized category. 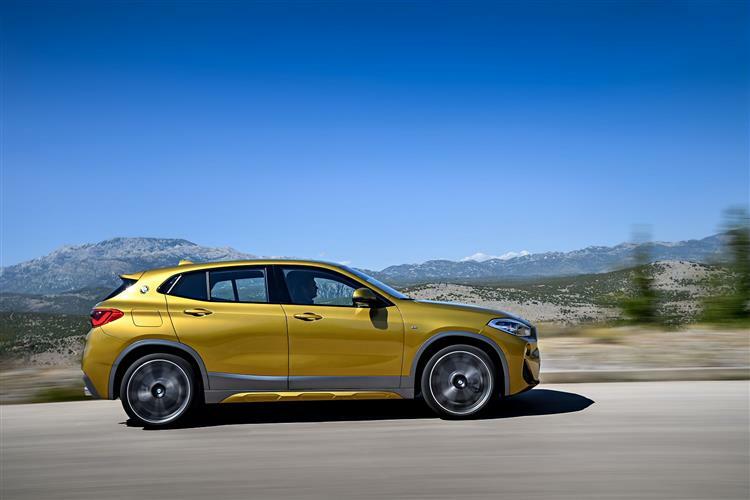 BMW's X2 is the first model though, that could really be called a 'coupe' in the smaller SUV 'C'-segment popularised in the volume end by crossovers like Nissan's Qashqai and at the premium end by models like BMW's own X1. Predictably, it's the X1 that provides almost everything for the X2 under the skin. But this sleeker design packages those mechanicals up more dynamically in a way that's sure to appeal to folk attracted to slinkier models like Jaguar's E-PACE in this segment. Being based on the X1's MINI-derived 'UKL2' platform, the X2 primarily uses BMW's efficient generation of four-cylinder engines. The most affordable sDrive variant is front driven, while the other xDrive derivatives use the brand's intelligent all-wheel-drive system, which distributes the engine's power between the front and rear axles as the situation requires. There's also a wide track, short overhangs and the usual 50:50 weight distribution. Obviously, the X2 is not inended for off road use, but it does have an integral Hill Descent Control feature that enables you to automatically maintain a desired speed on steep descents by taking care of brake control. Engine-wise, the mainstream range offers one petrol option and two diesel units, all of which are 2.0-litres in size. 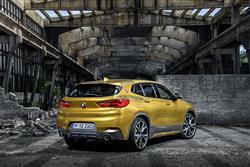 The sole xDrive20i petrol variant is powered by a 192bhp four cylinder unit. Most X2 sales though, will be made with the diesel variants. There's the choice of a 190bhp 4WD xDrive20d model. 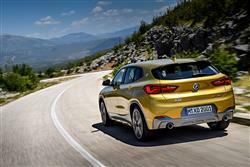 Or, if you can't stretch to that, a 150bhp 2WD 18d diesel option with sDrive or xDrive alternatives. The car's driving responses can be adapted by using the Driving Experience Control switch, allowing the driver to choose between default COMFORT mode, efficiency-enhancing ECO PRO mode and a SPORT mode which gives the car even dynamic steering and powertrain responses. The optional Dynamic Damper Control system works via these same settings. Even next to its bigger coupe-SUV BMW range stablemates, the X4 and X6, the X2 makes a distinctive impression. It's 2cm shorter and more than 7cm lower than the MINI-derived X1 crossover model it's based upon, yet has the same wheelbase. Featuring short overhangs, it also has a stretched, coupe-style roofline and slim window graphic. The kidney grille has always been an identifying feature of the Munich marque but on this car, it's wider at its base than at the top, which gives the nose a broader, more distinctive and sportier appearance. At the rear, horizontal design lines emphasise the car's width, with these creases continuing into high-set LED rear lights that feature an 'L' shape familiar from BMW coupes. 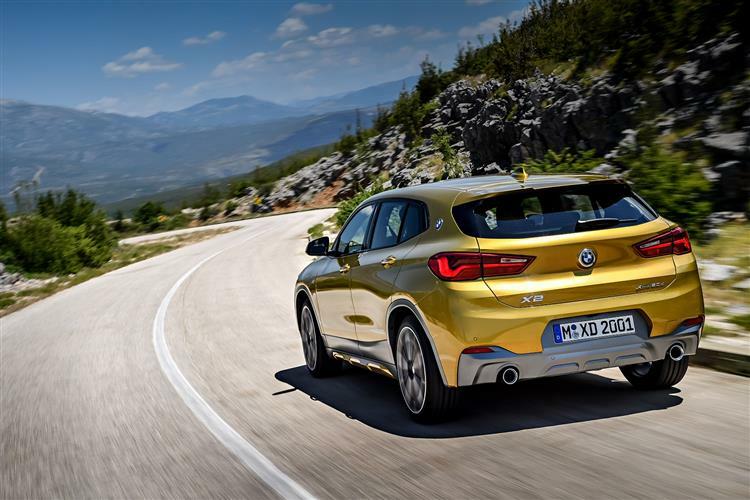 Lower down, the car hints at the power of its BMW TwinPower Turbo engines through the design of the tailpipes, all X2 models coming with a twin exhaust arrangement that's 90mm diameter. A spoiler provides a flourish to round off the roofline and contributes to a drag co-efficient of just 0.28Cd. Inside, there's a driver-focused cabin and a soft-finish instrument panel with contrast decorative stitching. As for practicality, well the cabin has plenty of storage, including a door design featuring large storage pockets. There's also a generous 470-litre boot. 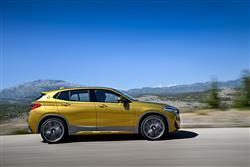 Prices are pitched at around £34,000 for the volume X2 xDrive20d SE variant. That's about £2,000 more than you'd pay for an equivalent X1 model. Across the range, standard specification includes a 6.5-inch Touch Control Display with navigation system. And there's the option of a full-colour Head-Up Display. 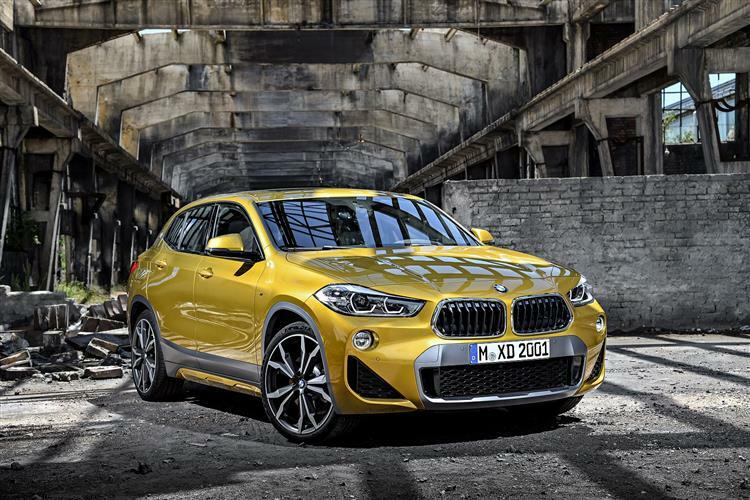 Many X2 buyers will be tempted by top-spec 'M Sport' trim, which gives you the usual more dynamic outward styling cues, plus 'Micro Hexagon' fabric Anthracite/Alcantara combination upholstery with M piping in blue or yellow with contrast stitching on the instrument panel and the centre console as standard. Full-LED headlights are standard on Sport, M Sport and M Sport X models. As standard, both models are fitted with 19-inch wheels. The standard rims for the SE model are 17-inch V-Spoke style light alloy wheels, but ten other rim designs can be specified as an option. Media Connectivity has been prioritised, to suit the prevailing trend, the 'BMW Connected+' package providing a digital bridge between smartphones and the car. You can specify WiFi hotspot preparation, which equips the X2 to host a built-in WiFi hotspot with LTE speeds, and the optional telephony with wireless charging for compatible smartphones. Surprisingly, 'Apple CarPlay' smartphone-mirroring connectivity costs extra too. As you'd expect from a current BMW, emissions are low and fuel economy is excellent. The 190bhp xDrive20d model will get 61.4mpg from a gallon of fuel and 121g/km of CO2, which is impressive for a 4WD diesel SUV. If you want to do better, there are lesser-powered '18d' variants, one of which offers the option of sDrive 2WD. Of course the driver must also play his or her part. So there's an Optimum Gear Shift Indicator on the dash and an ECO PRO mode you can select in the Drive Performance Control system that'll focus all the car's systems on ultimate frugality. The extra economy created in that ECO PRO setting (BMW reckon it could be up to 20%) is fed back to the driver, with in-car displays showing the additional number of miles achieved. What else? Well as usual with a BMW, there's a condition-based service indicator on the dash to advise you when your car needs a garage visit, but new to me was the clever 'TeleServices' feature that comes as part of the BMW 'ConnectedDrive' services you can access through the iDrive infotainment system. Via this, before each service appointment is due, your X2 can put in a 'TeleServices' call to your nominated BMW service centre, complete with detailed information on vehicle condition. You'll then get a call to arrange a service appointment. The X2 represents another box ticked in BMW's X-model product development plan. Its MINI-derived underpinnings serve it well in terms of delivering the sporty feel promised by the sharper looks this design enjoys over its X1 donor model. And the four cylinder engine range is pleasantly frugal and efficient. So there's lots to like if you can afford the premium asking prices. But there's also lots of more affordable competition in this segment. Still, one thing's not in doubt. This X2 certainly seems to have the X Factor.